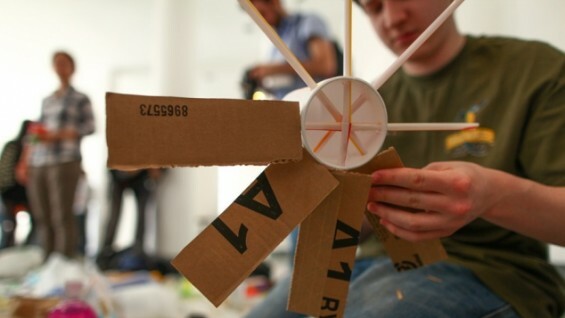 On Tuesday, March 20, Cooper Union hosted its annual egg drop competition. Students from all three schools were invited to form teams and create devices that would help safetly deliver a chicken egg from the third-floor portico of the Foundation Building to the concrete ground below. Egg drop devices were constructed by students on site starting at noon, and teams individually began dropping eggs a little after 1:00. Teams were judged on a vareity of factory, including the total weight of their devices and egg (less is more, in that case) and the team's accuracy in hitting a target with the device and its egg payload when dropped from the portico. Local media was there on the scene and covered the event. Reporters from The New York Daily News and the New York Times blog got the scoop on this exciting Cooper tradition.